The enthusiasm generated by former three-term Rep. Beto O'Rourke may seem reminiscent of another politician who had only spent a few years in Congress before running for the White House — President Barack Obama. In a video released in the early hours of Thursday morning, with his wife Amy by his side, O'Rourke announced, "This is a defining moment of truth for this country," adding what appears will be the focus of his campaign, "the interconnected crisis in our economy, our democracy, and our climate have never been greater." O'Rourke is in Iowa for three days of campaigning, which includes canvassing for a Democratic state Senate candidate in an upcoming special election, running a 5K race and taping an episode of a local political podcast. He's also planning a campaign rally in El Paso on March 30. The 46-year-old mounted a stronger-than-expected challenge to Republican Sen. Ted Cruz last November, coming within 3 points of victory in the deep red state. He raised about $80 million for his bid, most of it from small-dollar donations, and amassed a nationwide grassroots following while eschewing traditional campaign methods. When asked about O'Rourke's entrance into the presidential race this morning, President Trump referred to O'Rourke's energetic hand movements in his announcement video and asked, "Is he crazy or is that just the way he acts?" For some, the enthusiasm the three-term congressman generated may have seemed reminiscent of another politician who had only spent a few years in Congress before running for the White House — President Barack Obama. But with just three terms in the House and losing his only statewide bid for office, it could lead others to question whether O'Rourke has the necessary experience for the nation's highest office. In a video released early Thursday morning, Beto O'Rourke, with his wife Amy by his side, announced, he is running for president. "This is a defining moment of truth for this country," he said. O'Rourke's 2018 Senate campaign didn't fit the usual mold. He didn't hire traditional political consultants and pollsters, didn't take any PAC money and refused to go negative against Cruz. O'Rourke didn't just focus his campaigning on urban and suburban areas typically rich with Democratic voters — he traveled to all 254 Texas counties, committing to visit even the reddest, most rural places. Some had encouraged O'Rourke to make another run at the Senate again, challenging Republican Sen. John Cornyn in 2020, but he decided to seek higher office instead. O'Rourke had mulled a presidential run for months and took an unusual break for what appeared to be some soul-searching after his loss, taking a road trip to New Mexico, Kansas and elsewhere. 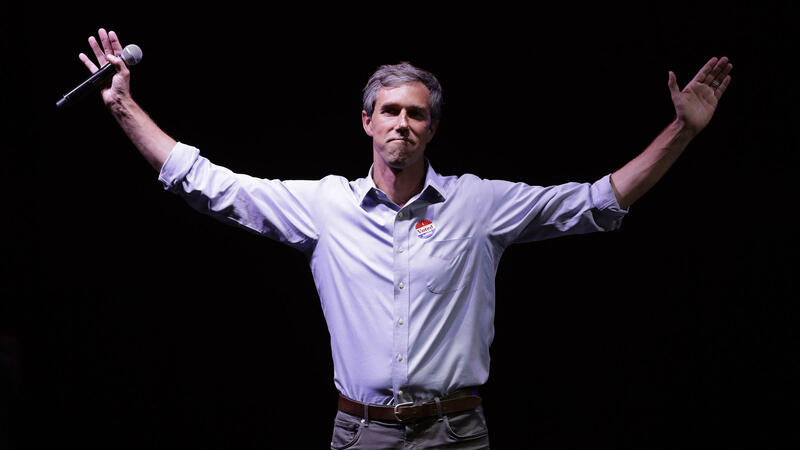 "I had to be moving, I had to be meeting people," O'Rourke told Oprah Winfrey in a February interview. "It's just how I think, how I find the next step. I just truly emerged out of this by being with people." Some Democrats criticized that unorthodox strategy, as other top White House hopefuls were building national and state teams and making numerous early state visits. But O'Rourke's momentum seemed to be revived in a big way last month amid the debate over building a wall along the Mexican border — right along his hometown of El Paso. When President Trump held a rally in the city, which already has portions of fencing, O'Rourke held a counter-rally. Trump relished the face-off, dismissing the Democrat's crowd size (which was later estimated to be at least as big as Trump's), claiming that this "may be the end of his presidential bid" and that O'Rourke was simply "a young man who's got very little going for himself except a great first name." The former Texas congressman pushed back on Trump's inaccurate claims that a drop in crime was due to the barriers in El Paso, telling supporters, "We know that walls do not save lives — walls end lives." Statistics have shown violent crime had dropped in the city well before its wall was erected. "We are making a stand for truth against lies and hate and ignorance and intolerance," O'Rourke said. "We are going to show the country who we are. We're going to make a stand to ensure that we live up to our promise, to our potential, to our purpose as a country." It wasn't the first time O'Rourke generated national attention for taking on Trump. After the president attacked NFL players for kneeling during the national anthem to protest police brutality, O'Rourke responded at a town hall that he "can think of nothing more American than to peacefully stand up, or take a knee, for your rights, any time, anywhere, in any place." The clip went viral. O'Rourke has the potential to occupy a unique place in the still-forming 2020 Democratic primary field. He has gotten some support from the progressive wing of the party but has centrist appeal and a history of bipartisanship too, ultimately resistant to any type of label. And he has the younger, newer face some in the party are eager for and has also gone toe-to-toe with Trump. O'Rourke was first elected to Congress in 2012, upsetting eight-term Rep. Silvestre Reyes in the Democratic primary. Before that bid, O'Rourke had served on the El Paso City Council for six years and had founded his own technology company. He's an El Paso native whose father was also involved in local Democratic politics. He attended Columbia University, where he played in a punk rock band called Foss.